Navi Mumbai, a planned city, has huge potential to embrace a lot of sustainable transport concepts. Photo by seaview99. 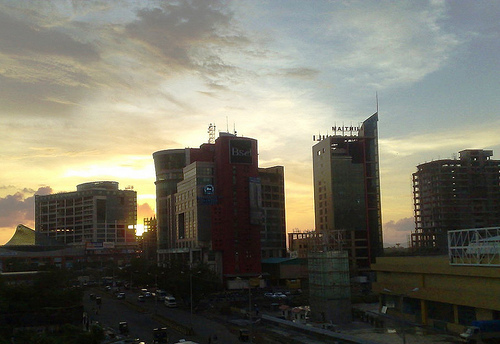 Navi Mumbai is a planned city to the east of Mumbai proper, just across the Thane creek. 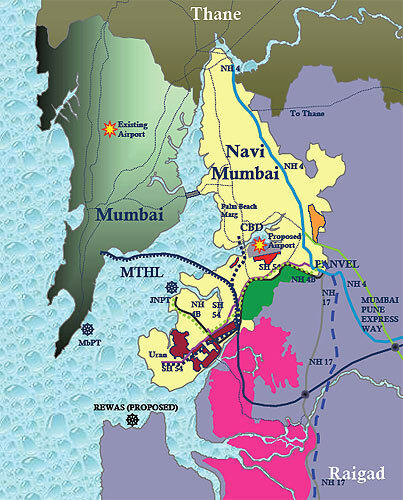 Beginning in the 1960s, the Maharashtra government made a concerted effort to reduce congestion, crowding and environmental degradation in Mumbai by transferring industry and commerce as well as building new residences in Navi Mumbai. In some sense, Navi Mumbai is just another suburb of Mumbai, but in some other ways, Navi Mumbai is the solution to Mumbai’s problems. Map by Nagraj Sheth of the Institute of Technology. CIDCO’s strategy to make Navi Mumbai an attractive destination consists of building a golf course, an airport and other facilities that attract the rich. Similarly CIDCO’s strategy for transportation has been to create an automobile-friendly network of wide roads and grade-separated junctions (flyovers). The only concessions made for the less wealthy are the single train line that bisects the city and a small bus service. Even these services are increasingly being targeted towards the rich. All railway stations in Navi Mumbai have lots of parking, and the bus service now runs special air-conditioned buses with higher fares for the richer segments of the population. What does that mean for the “common man”? We must understand that a family that earns the average family income Rs. 115,000 will have to spend at least 1.5 times its annual income to buy the car, and one-third to half its annual income to buy a two-wheeler. Clearly, many families in that income range are unable to afford either vehicle. Given that typically about 80% of the population lives below the average income, that’s a large chunk of the city which is essentially dependent on public transport. Further, even among families that do own a vehicle, typically only the head of the household gets to use the vehicle on a daily basis; the others may still use public transport. But users of public transport face several difficulties in Navi Mumbai. First, low densities and natural barriers like mountain ranges or creeks result in longer distances in the final step of the journey – from the train station to home. In Vashi or Kharghar, the last step of the journey may be as much as 4 kilometers long. Bus services are unreliable and auto-rickshaws are costly. Walking takes time and is not always safe. The city’s response to these problems has been on predictable lines. Where pedestrian safety has been an issue, they have mooted skywalks. They have also tried – to the extent possible – to expand bus services and increase train frequencies. But providing better last-mile connectivity by enhancing the public transport network or level of service might not be possible. The trains already run on a 10-minute headway in the southern part of the city and a 20-minute headway in the northern part. Buses also run at 15- to 20-minute headways during peak hours. New buses and trains cost a lot of money, and it is unlikely that enough funds are available for the purpose. A proposal for cycle lanes in Kharghar. Image via Google Earth. 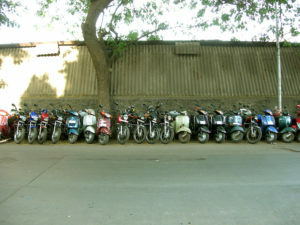 Given the financial constraints, I believe cycling offers an easy way out for the problems of Navi Mumbai’s residents. Cycling requires very little investment on the part of the user, and for short distances it offers the user a flexibility unmatched by any form of public transport. In the current context, one can make the trip from home to the train station faster on the cycle than by bus. But for people to cycle to the station, two conditions must be satisfied: 1) Cycling must be reasonably safe; and 2) Safe parking should be available at the train station. Currently, neither condition is satisfied. There are no cycle racks at the train station, thereby providing no protection from cycle theft. As for road safety, the less said the better. What distinguishes the case for cycling infrastructure is that this is low-hanging fruit. Unlike their counterparts in Mumbai, train stations in Navi Mumbai already have a great deal of parking space that often goes empty. Diverting some of that space to cycle parking with a metal sheet on top would cost next to nothing. 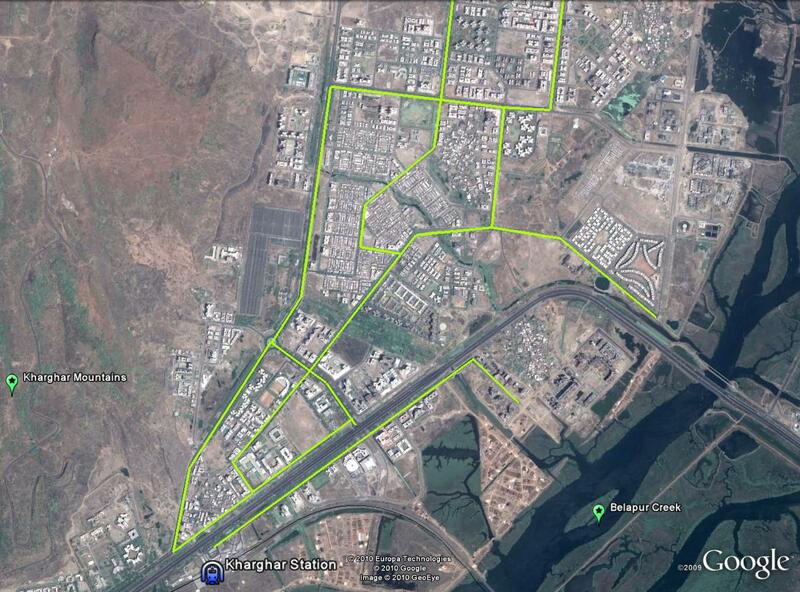 Even the roads in Navi Mumbai are rather wide and relatively under-used. Which means less political opposition to diverting some of that space for cycles by creating a cycle lane. These new lanes need not be curb-separated; for starters, a differently coloured lane indicating right-of-way for cycles is an option that can be considered. However it is crucial that traffic policing is stepped up to ensure that pedestrian and cyclist rights-of-way are being honoured by motorists. Parking in Andheri (Mumbai City). Image via Kunal Bhatia. Overhead Parking in Kharghar, Navi Mumbai. Image via SPA consulting. Beyond this, the city can take several other steps for last-mile connectivity. Inviting bike-renting services like FreMo to setup shop in the city gives newbies a chance to experiment with cycling. 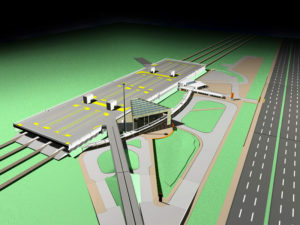 Colleges and major workplaces can be asked to provide transit from the station. Keeping minimum feeder service till midnight gives commuters a sense of security that they won’t be stranded if they get back late. Navi Mumbai has a mandate to attract persons from Mumbai and reduce the congestion and over-crowding there. But to achieve that, Navi Mumbai needs to provide better quality of life to all its residents. This means more than just space for recreation and low population density. It also needs to make the daily trip to work cheaper and less time-consuming. Providing wide roads caters only to a small section of population, even in the rich localities. But even such automobile-friendly development can be easily retrofitted to serve the needs of the common man. That is exactly what Navi Mumbai needs to do right now.